Summer time is the best time to visit Niagara Falls. The months between June and August are peak season because the temperatures are in the low 80s. This might sound warm, but with all of the breezes from the waterfalls, the air feels cooler than the actual temperature. Of course, because it is peak season, there are more crowds, but this is the best time to experience all of the attractions and enjoy the pleasant weather. The spring and fall months result in less crowds and cooler temperatures. Room rates also go down. Room rates are at their lowest in winter, but because of the freezing temperatures, many of the attractions are closed down. 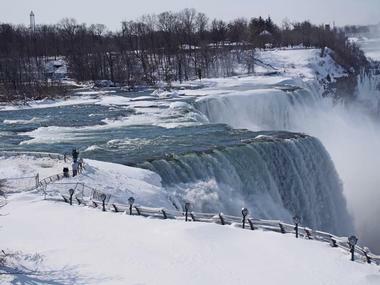 January is the coldest month of the year at Niagara Falls. With an average high temperature of 32°F (0°C) and an average low temperature of 15°F (-9°C), January also sees the most snow fall in the year. Average snowfall at Niagara Falls during this month is at 24 inches (61 cm). In February, the temperature increases by just a few degrees resulting in an average high temperature of 34°F (1°C). Meanwhile, the average low temperature drops to 17°F (-9°C). The average snowfall in February decreases considerably to 15 inches (38 cm). Despite the snowfall, February is the driest month in the year with a precipitation average of just a little over 2 inches (56 mm). Niagara Falls Weather in March: Temperatures continue to increase in March as winter comes to a conclusion and spring settles in. Snowfall decreases to 13 inches (33 cm) and the average high temperature rises to 42°F (6°C). The low temperature average is 24°F (-5°C). April brings the last of the snow fall for the season with an average of 3 inches (3 cm). The average high temperature climbs to 56°F (13°C) as spring continues while the average low temperature also increases considerably to 35°F (1°C). In May, the average high temperature spikes to 68°F (20°C). Average low temperatures hit 45°F (7°C). Niagara Falls Weather in June: Summer arrives at Niagara Falls in June with the average high temperatures and average low temperatures ranging between 76°F (25°C), 56°F (13°C). This is the third warmest month of the year and the start of the peak travel season in the area. July is the hottest month out of the year at Niagara Falls as average high temperatures spike to 81°F (27°C). Evenings bring a respite from the beat with an average low temperature of 61°F (16°C). August is the second warmest month of the year coming in at 72°F (22°C) for the average high temperature. The average low temperature decrease to 59°F (15°C). In September, Niagara Falls welcomes autumn which brings average high temperatures of 72°F (22°C) and average low temperatures of 51°F (11°C). The climate is warm, but pleasantly so and is one of the best times to see the falls. Niagara Falls Weather in October: Autumn goes into full swing in October with temperatures making a steep drop. Average high temperatures fall to 60°F (16°C) while average low temperatures drop to 40°F (5°C). In November, snow starts to fall again with an average of 4 inches (10 cm) to be expected. November also has the high precipitation rates in the year with 3 inches (86 mm) of expected rainfall. The average high temperature and average low temperature ranges between 48°F (9°C) and 31°F (0°C). December has an average high temperature of 37°F (3°C), the third coldest out of the year, and average low temperature of 22°F (-6°C). It also receives the second to the most snow fall in the year at 18 inches (46 cm). For the best weather in and around Niagara Falls in New York, the best time to visit is from mid May through out mid September. However, the peak season occurs between July and August so it’s best to avoid these months if you do not like big crowds. The best time to come to avoid the crowds and to get pleasantly warm temperature is during the first half of September. In general though, there is no peak or low season in New York as each month brings incredible things to see. For the Macy’s Thanksgiving Parade, come in November. Meanwhile the best time to appreciate the beauty of New York’s parks is between the months of March and May. 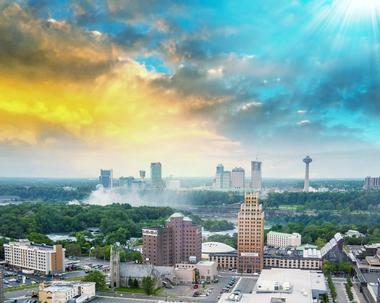 There are two airports that are close to Niagara Falls: the Buffalo Niagara International Airport and the Niagara Falls International Airport. 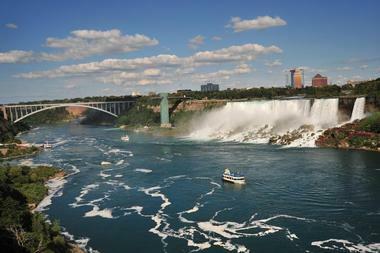 There are several ways to get from the Buffalo Niagara International Airport to the falls. There are many car rental agencies located at the airport. Many shuttles, vans, and taxis are also available. The Niagara Frontier Transportation Authority (NFTA) provides a Metro Bus that is an inexpensive, convenient, and quick way to get into the city. 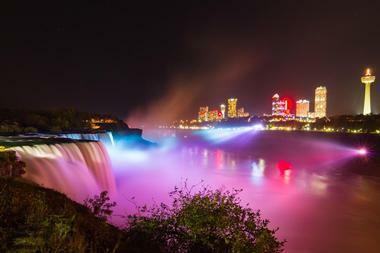 To get from the Niagara Falls International Airport, there are rental car agencies, taxis, and limousines. NFTA also runs a Metro Bus from the airport to the city. 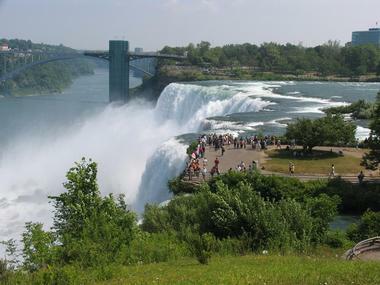 On the United States’ side of the falls, the Niagara Tourism and Convention Corporation operates the Niagara USA Official Visiter Center. It is conveniently located in the Downtown Niagara Falls Tourist District just a few minutes walk to the Niagara Falls State Park. The visitor center is open every day of the week and is closed on major holidays. Staff can help tourists with accommodation reservations, itinerary planning, information about tours, tickets to attractions, and giving directions. On the Canadian side of the falls, Niagara Falls Tourism is the visitor information center for visitors who wish to see the Canadian part of Niagara Falls. This office provides the same kinds of service as the visitor center on the U.S. side. Crossing the border between the United States and Canada has changed over the past years. For citizens of the United States returning home from a visit to Canada, one of the following will be required to enter the U.S.; a U.S. passport; a U.S. Passport Card; an Enhanced Driver’s License; and Trusted Traveler Program Cards like FAST, NEXUS, or SENTRI enrollment cards. There are also several documents that will suffice for members of the U.S. Military, Native Americans, boaters, and birth certificates for children under the age of 16. Canadian citizens must provide one of the following: a Canadian Passport; an Enhanced Driver’s License, or a Trusted Traveler Program Card. Visitors who plan to view Niagara Falls and see the attractions of the city do not really need a car. There are car rental agencies, but driving a car around the city can be a nuisance: traffic and parking can be terribly frustrating in the summer because of the crowds who come to visit the falls during peak season. Parking in a lot is expensive. Most attractions are close enough to be able to get to on foot. 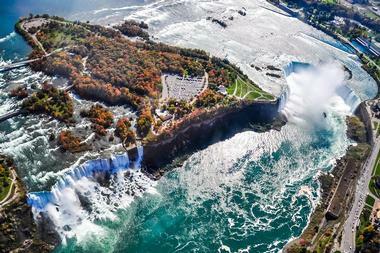 But there are also shuttles on both the United States and the Canadian sides of the falls. These shuttles will take you to the major hotels and to the most popular attractions. There are also tour buses and taxis. 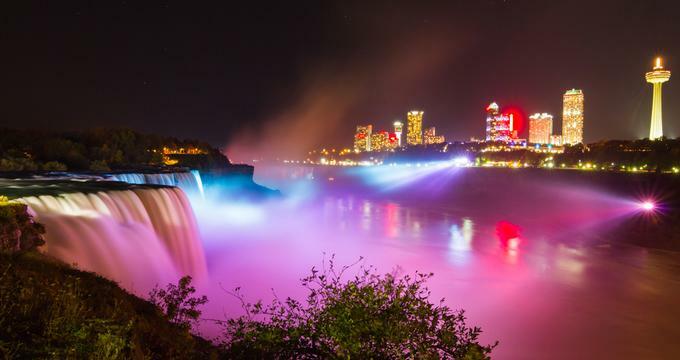 Niagara Falls is a world famous tourist attraction, so it is no surprise that there is a wide range of dining options available to visitors to the falls. Fine dining restaurants in the Falls Region include KOI, Red Coach Inn, Savor, Top of the Falls, and Western Door; Deflippo’s in the Canal Region; and Waterstreet Landing in the River Regions. If you’re looking for a trendy hip place try the Dockside Bar and Grill, La Cascata, the Sunset Bar and Grill, Wilson Boat House, or 700 Center Street. 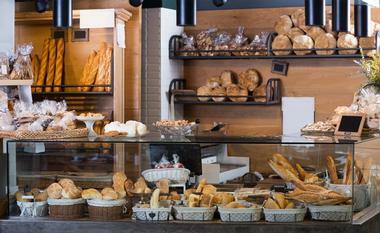 For farm-to-table food, there are several choices including Carmelo’s and Cream and Sugar. 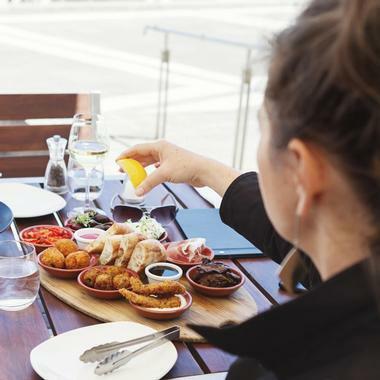 There are also steakhouses, pubs, and restaurants that feature al fresco dining. Many people visit Niagara Falls just to see the waterfalls, but there are other diversions once you had the water experience, and shopping is one of these. Although it is a small city, there are many antique shops, small boutiques, a designer outlet mall, and farmers’ markets. The Fashion Outlets of Niagara Falls USA is one of the top ten rated outlet malls in the United States. It features more than 200 designer stores and is located just ten minutes from the falls. Small specialty stores offer antiques, clothing, handcrafted gifts, jewelry and much more. Some of the popular souvenirs are snow globes, commemorative spoons, and, on the Canadian side, souvenirs with the red coats of the Canadian Mounties. For more than 200 years, Niagara Falls has been a popular place for weddings and honeymoons. It is sometimes referred to as the “Honeymoon Capital of the World,” with its attractions, spectacular venues, and outstanding landscapes. Many couples choose the Niagara Falls State Park as the setting for their wedding. Others choose to get married on the “Maid of the Mist” with views of the United State’s side of the falls as well as the Canadian side. Another unusual option is to exchange vows in a helicopter while flying over the majestic falls. There are also a number of historic churches as well as charming bed and breakfasts. A marriage license can be obtained at the City Clerk’s Office.